Cables and Connectors - Mencom offers a large range of cables and connectors, featuring M8 and M12 lines. 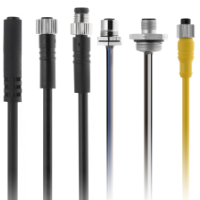 Mencom M8 connectors (NAN), are currently their smallest connector and available in both snap-on and thread-on versions .The M8 connector can be used for connecting small sensors or actuators, to transmitters or instruments. The M12 line has several series connectors that fall under this category. These cables can be used for connecting sensors such as M12 style sanitary sensors, industrial sensors or other sensors, to transmitters or instruments. Panel Interface Connectors – Device that typically mounts to the outside of a control panel housing a PLC, computer, or other type of programmable device. 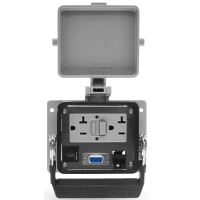 Once in place, the PIC, which houses convenient pass through connections, allows quick, easy, safe access to the controls inside the cabinet. Mencom, the industry leader in PIC , currently has well over 3,000 designs of PICs in production. Their engineers are designing new and custom PIC models every day. Industrial Networking Solutions - Mencom offers a wide range of industrial Ethernet switches such as Managed Switches, Unmanaged Switches, Gigabit Switches, Harsh Environment Switches, and EN50155 Certified Switches. 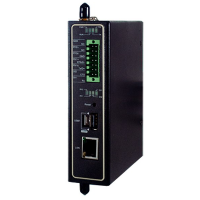 They also offer Secure Routers, Media converters, Serial Device Servers, Modbus Gateways and Power supplies.